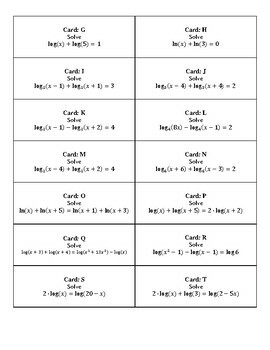 This activity includes all types of Logarithmic Equations and is a GREAT review before a test or quiz on this topic. 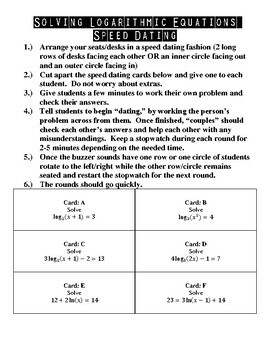 The speed dating game is a LOT of fun for my students and they ALWAYS ask to play the game again and again! In speed dating, you set the room up with either two long rows of desks facing each other or with an inner circle and an outer circle. If you choose the circles, then the inner circle should face out while the outer circle faces in. Students choose a seat across from another student. 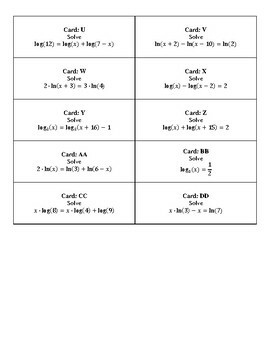 Give all students one problem card which will be THEIR problem card for the remainder of the activity. Students should then be given a few minutes to work their problem and to allow you to check their answer. Once all students know how to work THEIR problem card - the game begins. One row of students or one circle will rotate one seat to the left. This will force everyone to have a new "dating partner." Set a timer and have partners work the other person's problem and check their work with each other. 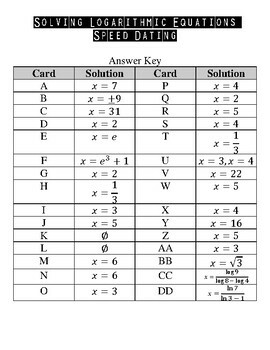 Once the timer goes off, students will get their own problem card back and rotate again until they have "dated" everyone in the opposite row/circle.